on September 24, 2018, 10:42 a.m. In a day and age of fast moving technology and tech savvy youth, it is no surprise that iPhone is the most positively talked about brand amongst millennials in the UAE. Facebook, which topped the list last year moved down to the second position while consumer electronics giant Apple remains at the third spot this year as well. 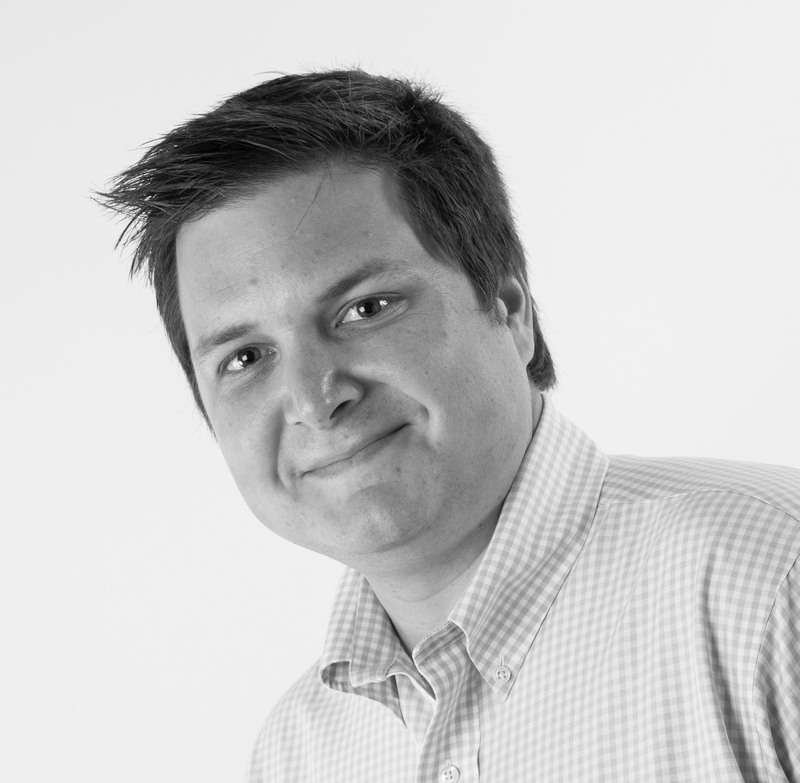 YouGov’s daily brand tracking tool, BrandIndex, considered the opinions of respondents aged between 18 and 34, collected online over the past year, to discover the 10 brands they’ve talked about the most positively with friends and family, whether in person, online or through social media. In a list dominated by digital brands, KFC has moved up to spot eight this year (compared to ten last year), while retail brand Carrefour and Egypt Air make an entry at number nine and ten, respectively. Holiday Inn Hotels & Resorts has seen the highest improvement in its brand perception since last year, increasing its score from 34.5 last year to 44.6 this year. YouGov data shows that Chocolates and Beverages brands such as Bounty, Mai Dubai, Quality Street and Tang are becoming increasingly popular among millennials and have shown great improvement in their scores from last year. 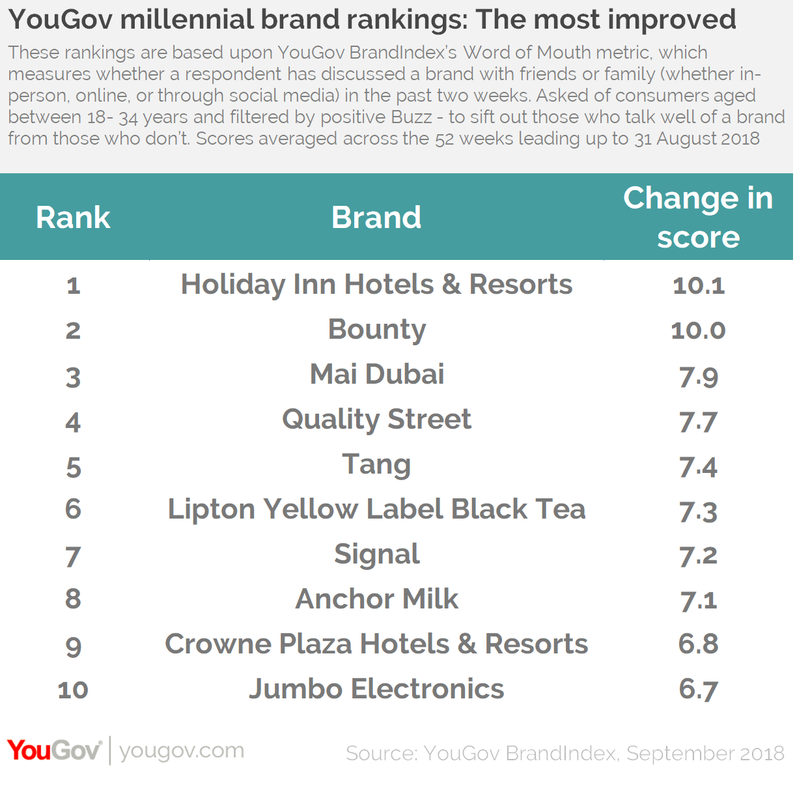 While Bounty has increased its score by +10, Mai Dubai has seen a change of +7.9 in its score, putting them in the top 3 brand improvers of the year according to YouGov Millennial Brand Rankings. 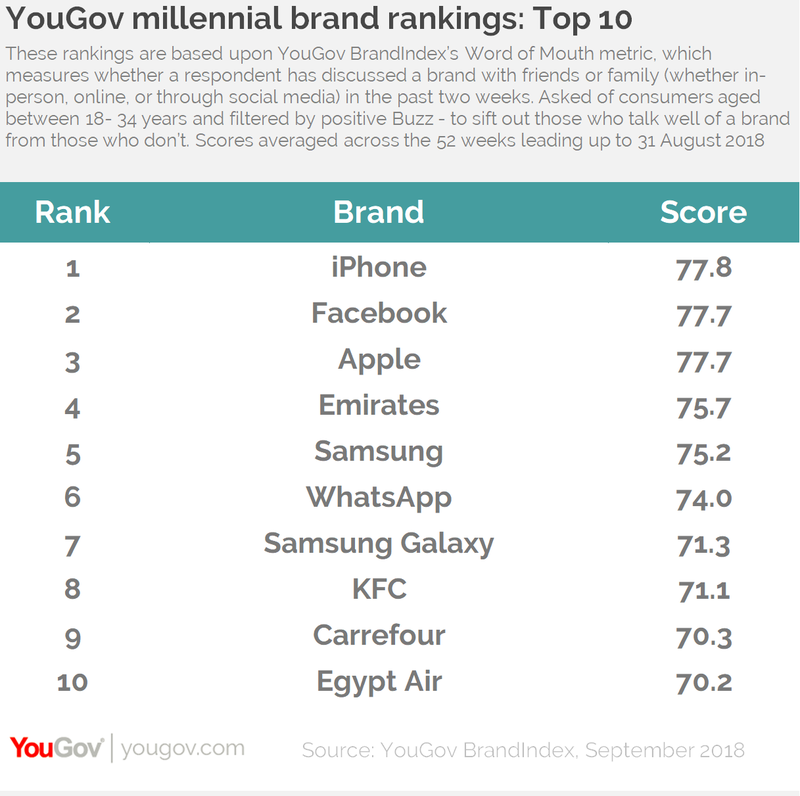 These rankings are based upon YouGov BrandIndex’s Word of Mouth metric, which measures whether a respondent has discussed a brand with friends or family (whether in-person, online, or through social media) in the past two weeks. Asked of consumers aged between 18- 34 years and filtered by positive Buzz - to sift out those who talk well of a brand from those who don’t. Scores averaged across the 52 weeks leading up to 31 August, 2018.